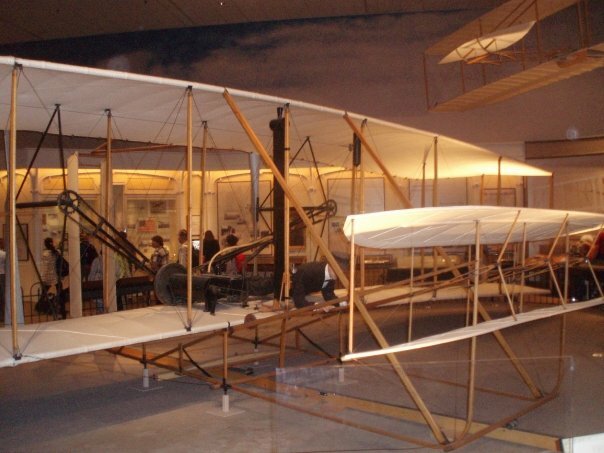 on display in the Smithsonian's National Air & Space museum in an exhibit titled "The Wright Brothers & the Invention of the Aerial Age". The Flyer's "runway" was a track of 2x4s stood on their narrow edge, which the brothers nicknamed the "Junction Railroad." In 1925, Orville attempted to shame the Smithsonian into recognizing his & Wilbur's accomplishment by threatening to send the Flyer to the Science Museum in London. The threat did not have its intended effect, and the Flyer went on display in the London museum in 1928. During the Second World War, it was moved to an underground vault 100 miles (160 km) from London where Britain's other treasures were kept safe from the conflict. 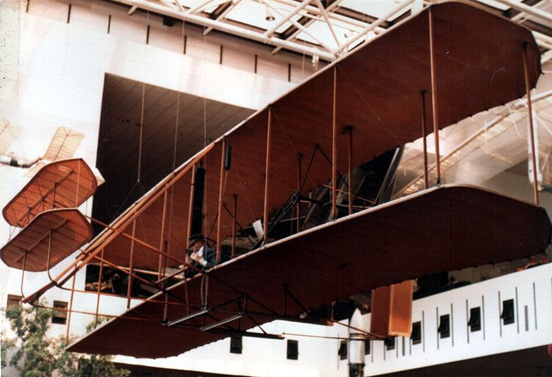 As the 100th anniversary on December 17, 2003 approached, the U.S. Centennial of Flight Commission along with other organizations opened bids for companies to recreate the original flight. 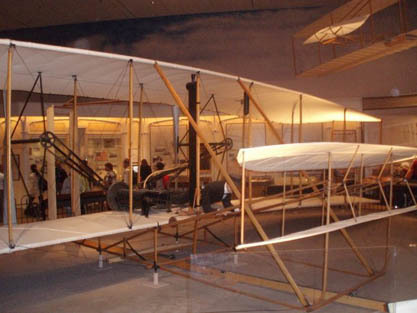 The Wright Experience, led by Ken Hyde, won the bid and painstakingly recreated reproductions of the original Flyer, plus many of the prototype gliders and kites as well as several subsequent Wright aircraft. The completed Flyer replica was brought to Kitty Hawk and pilot Kevin Kochersberger attempted to recreate the original flight at 10:35 AM December 17, 2003 from Kill Devil Hill. Although the aircraft had previously made several successful test flights, sour weather, rain, and weak winds prevented a successful flight on the actual anniversary date. Hyde's reproduction is displayed at the Henry Ford Museum in Dearborn, Michigan. Numerous static display-only, nonflying reproductions are on display around the United States and across the world, making this perhaps the most replicated single aircraft in history. ^ Mikesh, Robert C., and Tom D. Crouch, "Restoration: The Wright Flyer." National Air and Space Museum Research Report 1985, pp. 135–141. 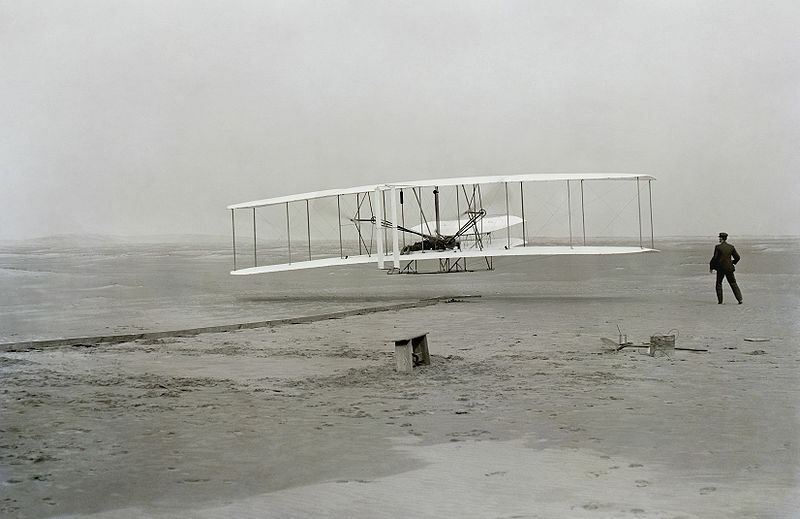 Hise, Phaedra, "In Search of the Real Wright Flyer." Air&Space/Smithsonian, January 2003, pp. 22–29. 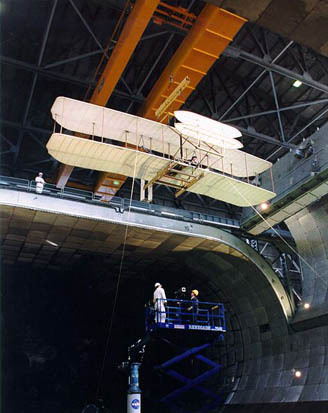 Jakab, Peter L., "The Original," Air&Space/Smithsonian, March, 2003, pp. 34–39. 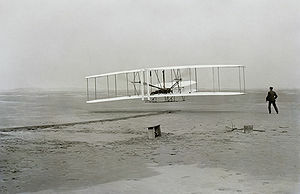 http://www.mywrightexperience.com/ The most historically and aerodynamically accurate PC simulations of the Wright Flyer.